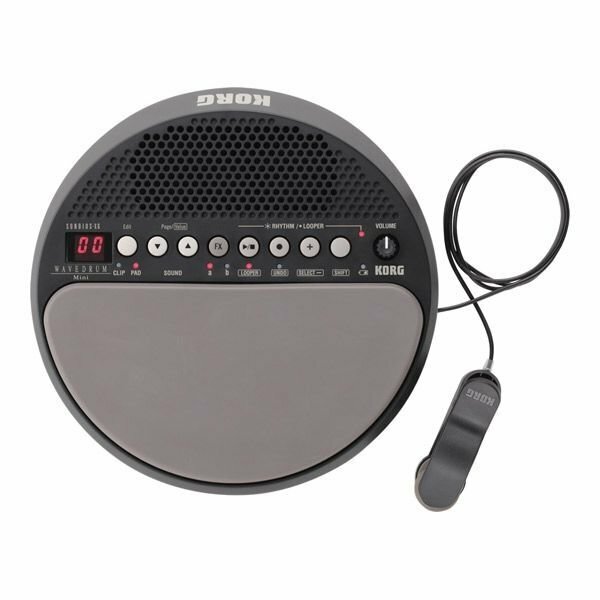 For on-the-go musicians, Korg has created the energetic Wavedrum Mini; with built-in speaker, battery-powered portability, and a revolutionary sensor clip that transforms nearly any object into an instrument. Using Legendary Wavedrum technology, the Wavedrum Mini delivers 100 sounds, 10 audio effects, 100 rhythm patterns, plus an overdubbing loop recorder! Tap your fingers on the Wavedrum Mini's expressive pad surface and play one of the 100 ready-to-play sounds. Attach the Sensor Clip to nearly any object or surface and play a second sound simultaneously. Add in one of the 10 preset effects; play along to any of 100 rhythm patterns; and add layer upon layer using the built-in Looper - Wavedrum Mini does it all! And, Wavedrum Mini is completely self-contained - offering battery power, onboard speaker, even a strap for securing Wavedrum Mini to your thigh as you play in a sitting position! AC adaptor and line out for home/studio use.